Waterloo – Wilfrid Laurier University will celebrate the grand opening of Lazaridis Hall, a signature building on the university’s Waterloo campus. An event featuring dignitaries from the provincial and federal governments will take place May 24 from 10 a.m. to 12 p.m. in the atrium of the building located on University Avenue. Lazaridis Hall is the new home of the Lazaridis School of Business and Economics, and the Department of Mathematics. Associated programs and centres are also housed in the building, including the Lazaridis Institute for the Management of Technology Enterprises (Lazaridis Institute), created to support growth-oriented Canadian technology companies, and the Schlegel Centre for Entrepreneurship and Social Innovation, which is building and supporting entrepreneurship and social innovation in the Laurier community. 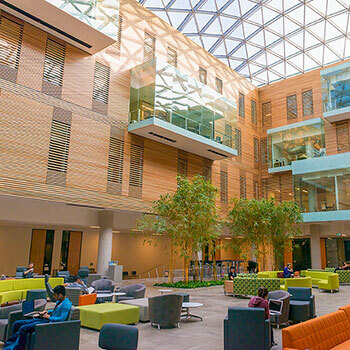 Designed by Diamond Schmitt Architects, Lazaridis Hall is a functional, bright open environment used by more than 6,000 students and more than 190 full-time and part-time faculty members. The building, which features a 1,000-seat auditorium and several meeting, teaching and collaboration spaces, will also be the site for a variety of events, including convocation ceremonies,business case competitions and national and international academic conferences. “This campus gateway building is an active learning centre designed to provide a dynamic environment for research and learning that supports interdisciplinary interaction and creates a strong sense of community and place for the university,” said Don Schmitt, principal of Diamond Schmitt Architects. The construction of Lazaridis Hall was supported by the Government of Ontario with a contribution of $72.6 million. The federal government also contributed $9.93 million in infrastructure funding. Mike Lazaridis, Canada’s renowned business executive, technology entrepreneur and philanthropist, pledged $20 million to create the Lazaridis Institute and his gift also provided significant support for the construction of the new 220,000-square-foot facility. The event on May 24 will feature remarks from President Blouw, Ontario Minister of Advanced Education and Skills Development Deb Matthews, MP for Waterloo and Minister of Small Business and Tourism Bardish Chagger, lead donor Mike Lazaridis, and others. Tours of Lazaridis Hall will be available following the formal remarks.